LONG BEACH — Hundreds of women have raced in the Linda Elias Memorial Women’s One-Design Challenge regatta at Long Beach since it was renamed for the special lady way back in 2003 — and the event just celebrated its 20th anniversary Oct. 22-23 (see the related racing story). Perhaps some of the younger competitors may wonder now: Who was Linda Elias? It may be time to retell her story. The Women’s Sailing Foundation of Long Beach/Los Angeles and the host Long Beach Yacht Club knew the answer well enough to link the inspiring character of a special female competitor with the event, not just because she won it three times but because of the spirit she brought to it, as her lyrical laughter mocked the mean disease she battled. The annual fleet-racing contest is sailed by 10-women crews on the heavy-duty Catalina 37s used in the Congressional Cup match-racing classic. Elias won it in 1992, 1994 and 1996, the last two while battling the ovarian cancer that ultimately outmaneuvered her late in 2002 at age 52. How tough was it dealing with the pain, the chemotherapy and her passion for sailing for the last nine years of her life? She explained it once:“The treatment takes most of the day. I have to be there at 8:30 and I get out by 4. They give me several different chemicals to counteract the main ones they give me. That night I’m sort of OK, and the next day the nausea sets in, but they give you pills to take. I learned after my second [treatment] to take ‘em whether you think you need ‘em or not. If you don’t you’re gonna get sick. That’s what happened to me Friday morning at 6:30 a.m. I started throwing up, and I kept throwing up until 4 o’clock. You can’t even keep the pills down. This time I took ‘em: no problems. And play she did. Long before the cancer, she helped to fight another battle, for women in sailing. She led several all-woman crews in ocean racing, including her favorite: the Transpacific Yacht Race to Hawaii. 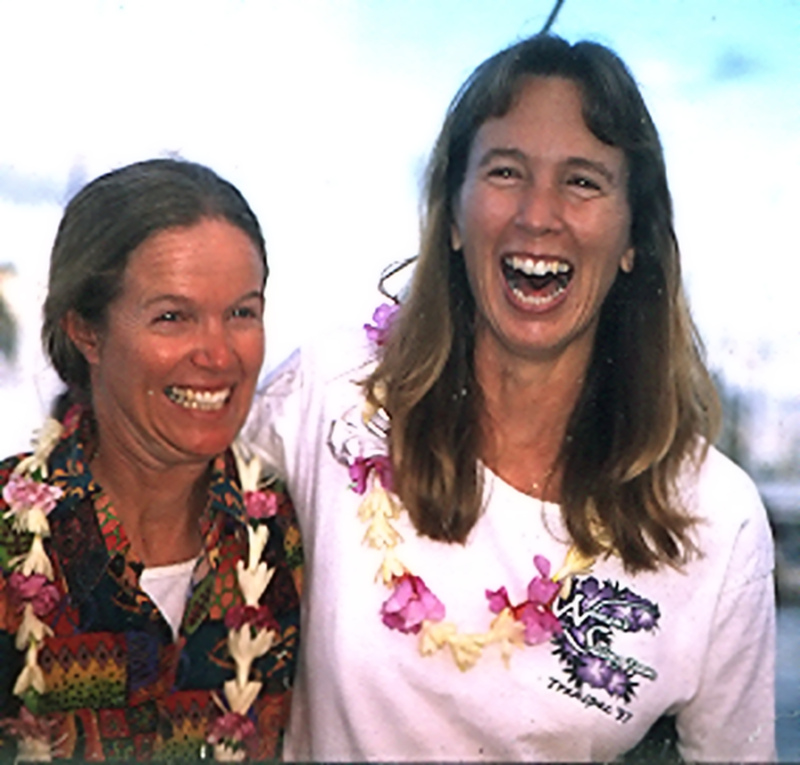 She missed 1995 because of the cancer but trained her crew hard to sail the Santa Cruz 60 Bay Wolf in the 1997 race. “I’d rather be out there,” she said. It got worse. A few days later she heard that the fleet was making record time. But her determination flared up beyond the cancer. She was determined to make the best of a rotten deal. If she couldn’t sail with her team, she’d at least fly to Hawaii and be there to meet them — and, boy, were they surprised when they saw her standing there, two weeks after major surgery, laughing and wearing a lei as large as the smile on her face. That moment defined her life. Sitting on the patio outside Long Beach YC for a one-on-one interview, she giggled her lilting laugh. “That’s another thing about having cancer,” she said. “It makes you realize, whatever the situation it is, OK, what’s the worst that can happen? You can lose the race. So what?